If you chance to meet Amanda Stevens, don’t be fooled by her sweet, southern smile. She’s one scary thriller writer-chick. After you read her very timely post here at the Handbasket, you’ll want to check out her novels: the ultra-creepy The Dollmaker (where’s the film? that’s what I want to know! ), The Devil’s Footprints and her March 09 release, The Whispering Room. You’ll want to read her blog, too. I cruise by regularly and not just because she sometimes has Clive Owen Wednesdays…. Plus, Amanda may be the only other person here who knows who Echo and the Bunnymen are! 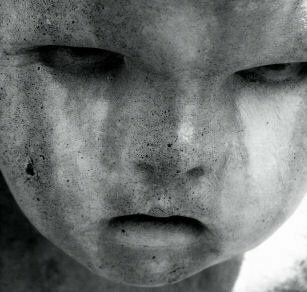 The protagonist in my WIP is a taphophile, a person who loves cemeteries and funerals (not to be confused with a necrophiliac, which would be a whole nuther story). I wouldn’t say I’m a full-blown taphophile, but I do share my character’s fascination for old cemeteries, gravestone symbolism and burial rituals. • In Germany, a cemetery plot is ‘leased’ for only a certain amount of time–ten, fifteen, twenty years. If you don’t renew your lot fee, they dig you up and remove the headstone. • Corpses are no longer decaying in many German cemeteries. Instead, the deceased become waxen, an uncanny process that has disturbed the natural cycle of decay. • The bone cathedrals in Rome use human remains for decorations, including bones fashioned into chandeliers. • In New Orleans, family members can share the same vault as long as the previously deceased family member has been dead for at least two years. If a family member dies within that two-year restriction, local cemeteries are equipped with temporary ‘holding’ vaults. • Washington Square served as a potter’s field where the indigent of New York City were buried for several decades. A lawsuit was recently filed to halt any changes to the square, claiming that it would be disrespectful to the 20,000 or so dead souls that lie beneath. The argument was justifiably overruled, seeing as how the city turned the graveyard into a public park in 1827 and ran Fifth Avenue straight through it. • Graveyard tourism is a growing phenomenon around the world. • After scratch marks were found inside several dug up coffins, the ‘bell’ custom was instituted in England. A string tied around the corpse’s wrist was also attached to a bell on the surface to eliminate the possibility of being buried alive. Graveyards sometimes hired workers to sit all night listening for these bells (the graveyard shift). • Hollywood Forever Cemetery (once known as Hollywood Memorial Park) offers biographies of the deceased in video kiosks, GPS disks to easily locate gravesites, and Cinespia, a summer film series where classic films are projected onto the side of a mausoleum for Saturday night audiences. • Old cemeteries are what some theologians have called “thin” places, where the veil separating our world and the next is translucent. 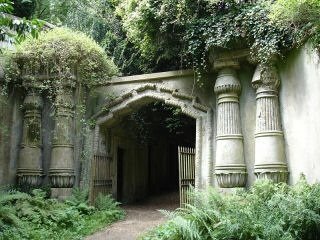 Lucy and I have visited some beautiful cemeteries throughout the South, but our aspiration is to one day tour Highgate Cemetery in London. 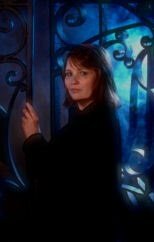 We would be in good company because authors Tracy Chevalier (Girl with a Pearl Earring) and Audrey Niffenegger (The Time Traveler’s Wife) have been known to volunteer as guides there. Not to mention that Highgate is where George Eliot, Karl Marx and Douglas Adams (The Hitchhiker’s Guide to the Galaxy) enjoy their perpetual slumber. But as the London Times puts it, the biggest attraction is the all-pervading gothic gloom. Isolation, desolation and eerie atmosphere–what more could a thriller writer–or a taphophile–ask for? Thanks so much, Amanda! I used to be so afraid of exploring cemeteries–not because I thought they were haunted, but because I thought I’d get in trouble. I think we should revive that quaint Victorian habit of picnicking in cemeteries. What a great cover for THE WHISPERING ROOM! Amanda Stevens is one fantastic author. So sweet and innocent and just down right scary. You are correct. I am an avid reader of hers. I cannot wait till the new novel is out. Thank you for having her. That is just wild about the German corpses. What’s in the ground over there, I wonder? Danielle–I’m so thrilled you liked The Dollmaker. As you’ve probably deduced, I love creepy dolls, old cemeteries and most anything that goes bump in the night. Halloween is my favorite time of year! Heather–Thanks! I’m happy they went back to blue and green so that it will match my website again! “So sweet and innocent and just down right scary…” How you warm the cockles of my heart, Lesa! Thanks for stopping by! It’s something in the soil, Alex. Creates a real problem for recycling the graves. Is the story behind “The Devil’s Footprints” based on a real legend? It is, Jane. It’s based on the footprints that were (supposedly) found in Devon, England in 1855. I moved it to Arkansas and set in the 1920s during the oil boom because I liked the notion that the devil might be coming up through one of the wells. Is Amanda gaining an unfair advantage in the competition by her ratio of comments to other readers comments? I think she should only be counted once for the choco choco chocolate bar. I mean, c’mon. On another note, I’m Amanda’s biggest fan. When I read her books, which are the ultimate in creepy and weird and fantastic, I almost feel like we’re related. But then I think, oh weird, no. I don’t think I could handle being close to someone so dark and sinister! Just joking, I love you. Great post. I can’t wait for more from you on this cemetery stuff. Totally your fortay. You’re crazy, Leanne. And weird. I couldn’t be prouder.